Vaulted ceilings, which on average are at least 11-12 feet high, are becoming increasingly popular among current homeowners, as well as those looking to build a home. Vaulted ceilings are incorporated in a wide variety of home styles from Farmhouse to Contemporary to Craftsman. 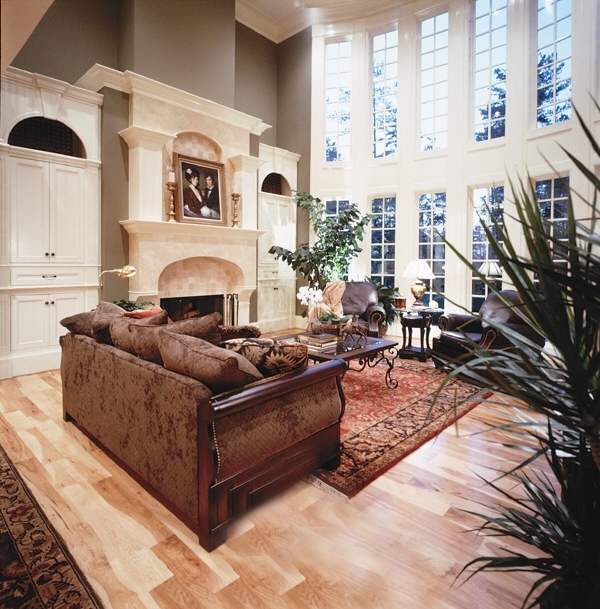 Most vaulted ceilings occur in living rooms, great rooms, foyers, and sometimes dining rooms and bedrooms. Any ceiling that extends past the common 8’-10’ ceiling heights is considered vaulted. These high heights, which began in cathedrals, have always been known for their ability to make any room look substantially bigger. We recently published a blog post about the open concept, which is essentially a wall-less connection between the kitchen, dining room, and living room creating a large, open, airy space. Vaulted ceilings and open floor plans seem to go hand in hand. 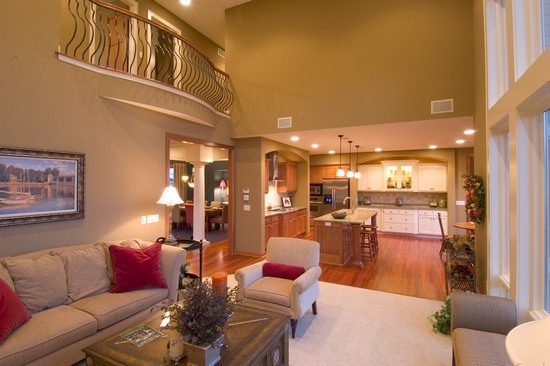 If you love wide open spaces in your home, you most likely are drawn to tall, open spaces as well. Whether you are interested in adding a vaulted ceiling to an existing home OR modifying a house plan to include these high, airy ceilings, there is definitely added costs and timing to be considered. Roof Trusses – For design, lumber, gussets, and machine setup. Lumber – Costs for truss bracing & drywall backers. Rough Carpentry – Time to line up the vault, install backers and bracing. Insulation – Time and material to install batt insulation in the sloped ceiling. Drywall – Time and material to hang and finish added ceiling area. Paint – Time and material to paint a taller ceiling area. As you search for the perfect house plan, don’t be dismayed if your favorite home doesn’t have a vaulted ceiling. It’s easy and affordable to have any house plan modified to fit your needs, even if that need is for a 12-foot ceiling. We facilitate numerous modifications of our over 15,000 house plans on a daily basis and on average, we receive about 2-3 requests a week for vaulted ceilings OR the opposite: to bring down the vaulted ceiling to a normal height. The latter is primarily because of the costs involved in building and heating a room with a vaulted ceiling. Building a vaulted ceiling can be a bit more costly because they require more building materials and labor. These tall ceilings can also create a steeper, more expensive roof by creating a larger roof line. Subsequently, because heat rises, vaulted ceilings are seen as wasted, heated space by some homeowners. Typically, we have found that families choose to vault family rooms and master bedrooms the most but occasionally, we receive requests to vault the ceilings in unexpected rooms, such as a loft. The price to modify a house plan to include a vaulted ceiling depends on the designer and the design of the house plan. To learn more about our modification process click here. Please contact one of our customer service representatives live on our website and we will gladly walk you through the modification process.